35 x 43 cm; 1 conveyance (deed)(A); paper; white, black printing; 27 x 21 cm; 1 map (B); fabric; beige, black and red writing. 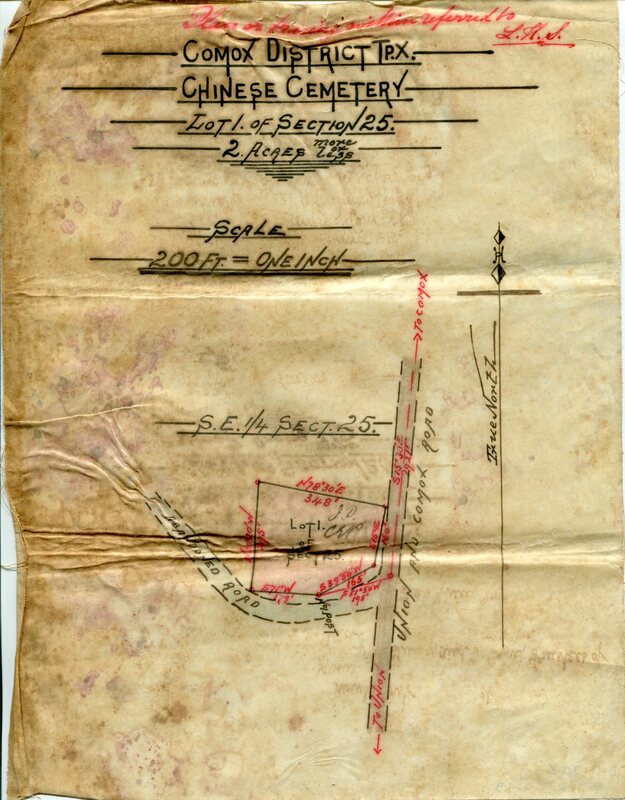 A: The original conveyance (deed) from the E &N Railway; September, 21, 1897 and notary signed on October, 4, 1897B: A map of the Chinese cemetery made with ink on fabric that reads: “Comox District Lot 1 of Section 25, 2 Acres More or Less”; it was signed by : Lai Yuew, Quong Melung, Tai Ou, and James Dunsmuir on September, 21, 1897 and notary signed on October, 4, 1897; the map has some ink bleed from the conveyance. Photographed: B: Map. Conveyance (deed) has some ink stains; the map has some ink bleed from the conveyance.